My family has a million Christmas traditions, dating as far back as I can remember. 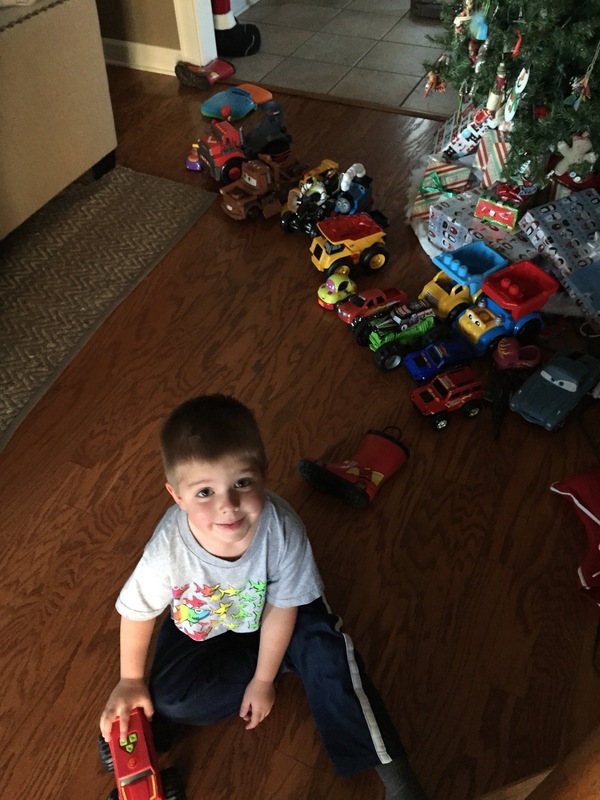 There are holiday traditions that I treasure and will always perpetuate, and there are traditions that, because of necessity, geography, having small children, and…time, have subsided a bit. It’s not that these traditions aren’t important to me, or that I’ll never pick them back up again. 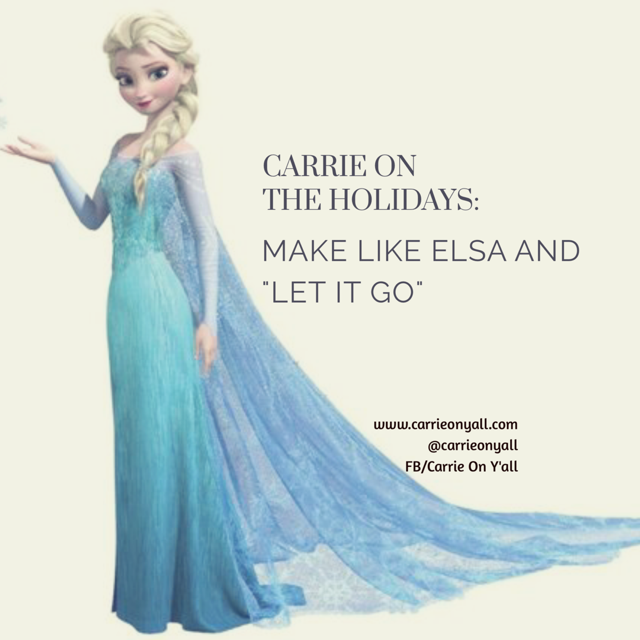 But for now, I’ve learned to take a frozen page of Elsa’s bio and “let it go.” Here are a few Christmas things I have let go over the years. 1. I Am Super-Lazy With Our Elf. I’ll admit it. Would I love to be super mom and have a charmingly mischievous elf whose messes and mayhem I clean up each day after the kids scuttle off to school? Um, no, not actually. As it stands, I clean up an average of 28 messes per day, and I’m certainly not going to work really hard to create more. 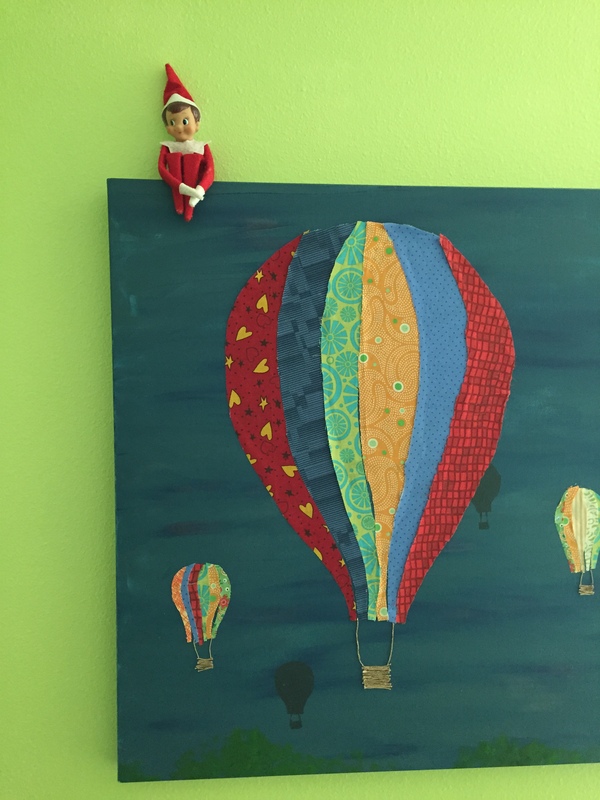 Our elf sometimes writes notes to the kids if they’ve been really bad. He hides up high every day for fear of becoming decapitated or the dog’s chew toy. This is if he remembers to move at all. 2. 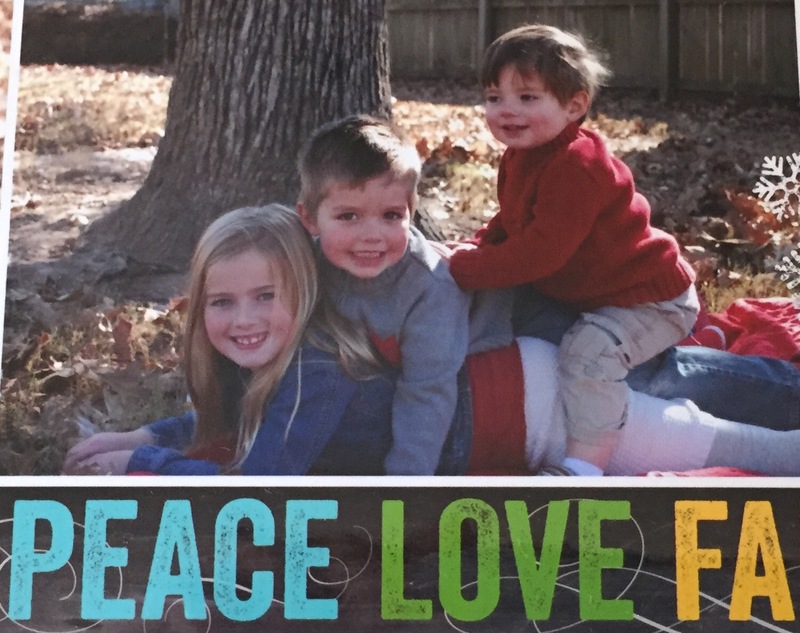 I Buy Cheap Christmas Cards, But This Year, You Might Not Even Receive One. Every year, I swear “this is the year I’m not going to cheap out!” This is the year that our Christmas cards will have professionally taken pictures which are then translated onto beautifully thick paper that is, preferably, cut into an intricate pattern (costs extra, don’tcha know?) and probably at least a 5×7 size so I can also pay extra postage. Here is our card from last year, the cheapest Walgreens vintage, printed in an hour. I took the pictures. Do you know how hard it is to get three kids to even look at you for a picture, much less smile and not get into a fistfight? 3. Stocking Stuffers. I am perennially crappy at this. 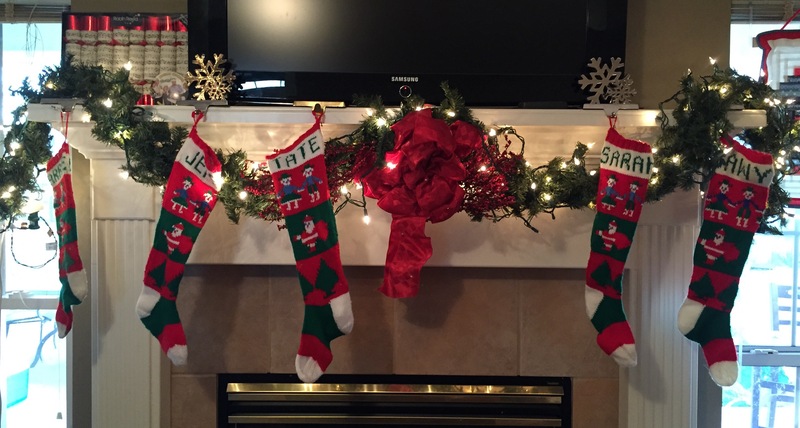 As a kid, I always wondered why Santa used the same presents in our stockings over and over, and when I asked my mom about it, she came up with a brilliant answer that I can no longer recall. Now that I’m a grown up, the box of stocking stuffers has been passed to me. We have a Fraggle driving a pickle car that my brother and I got from a Happy Meal sometime in the mid-80s…. So Mom, if you’re reading, please hook me up with the good stocking stuffer explanation. Being a crappy stocking stuffer may be genetic, so I might get a little pass for that. 4. 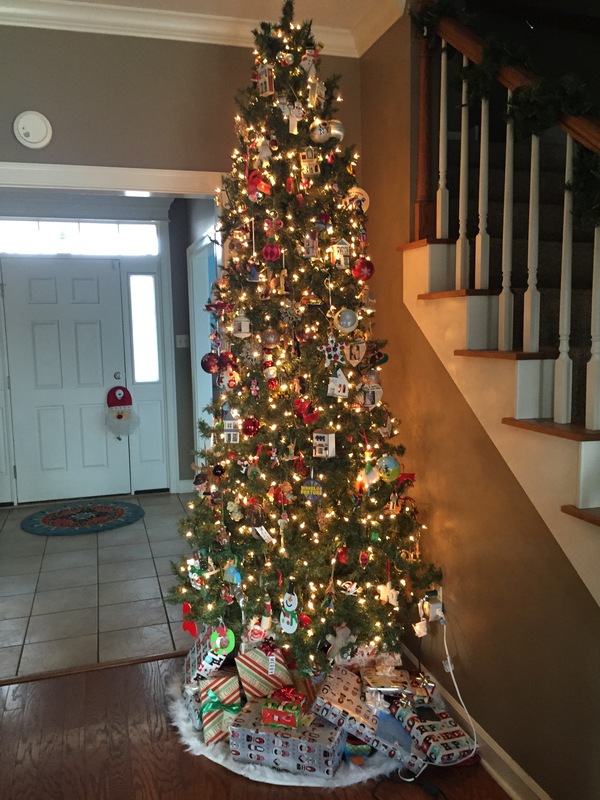 In Defense of My Non-Fussy Christmas Tree… Don’t get me wrong, I appreciate the beauty and sheer effort it must take to put together a decorator-worthy tree. But my tree is meaningful, holds irreplaceable memories, and to me is the most beautiful tree on earth. I wish all people the love that I feel for my Christmas tree. Our 9.5-feet slim, formerly pre-lit tree, while engineered and assembled somewhere in China, can bring me to tears if I look at it too closely. It has ornaments from my childhood, ornaments that my beautiful guardian angel Grandma Betty lovingly picked out for my every year of my life until she was too sick to do so, things my children have made, ornaments from dear friends, and ornaments that Jeff and I have collected together over the years. Jeff, quite possibly, may be more sentimental about our tree than I am, and that’s saying something, folks. So…while I do appreciate the designer trees, I prefer to go all Charlie Brown and love the tree that our history made. 5. Wrapping Presents Perfectly. 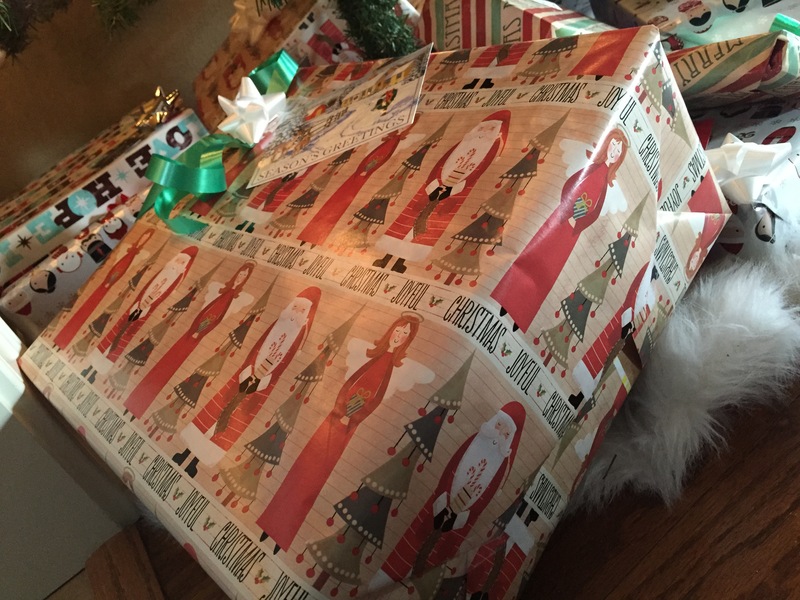 My husband Jeff is a touch OCD, and I think he dies a little inside when he sees me wrap Christmas presents. Many years ago, I read a Dave Barry article that had me crying I was laughing so hard about…wrapping Christmas presents. It basically covered the idea that men do not understand the concept of wrapping paper. 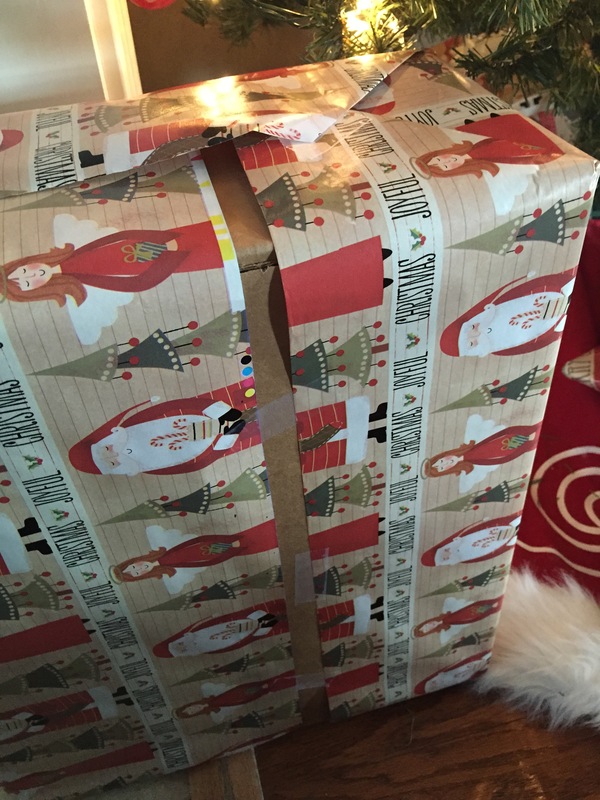 Well, Jeff skipped that lesson growing up, and he wraps presents like any OCD person would…perfectly. Dave Barry, on the other hand, understands my wrapping perspective like we were separated at birth. Below are pictures of a present I wrapped last night. To his credit, Jeff only winced a little, but I have a bet going with myself that, sometime before Christmas, he will tire of walking past the poorly wrapped offering, and re-wrap it himself. I myself do not see the point. Regardless of its perfection, the paper will end up in the recycle bin. I feel the same way about cake decorating (it will still taste good), making individual appetizers (seriously, who has time for that? I’m a chips and dip girl), and parade floats (one-hour-wonder). Here are, briefly, a few things I will forever hold dear at Christmas. And now, I’ll close. I would love to hear the traditions that you keep and let go! And I have to clean up what happened while I was writing this. See why I’m lazy about the elf? Car nativity scene, by Tate. 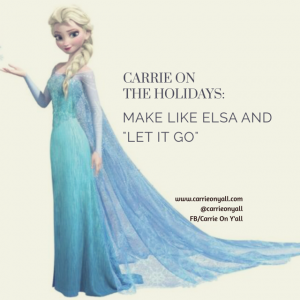 always love reading your blog Carrie… So clever and funny!